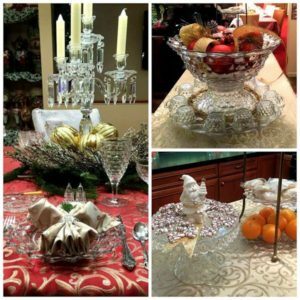 Please Note: the following is Part 3 in a continuation of posts regarding other American collectors and how they use Fostoria American for the holidays. One day per week, until Christmas Day, I will share a few holiday thoughts and pictures of my American collector friends. Each one will be different – some will be simple, others more extravagant – but all will have meaning. This set of photos was sent in by Michelle Sugg of Rochester Hills, Michigan. 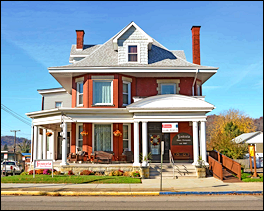 Amazingly, her family has been collecting Fostoria American for four generations! Michelle’s great grandmother (on her mothers side) started with American, who later passed it on to her daughter (Michelle’s grandmother). It was later passed on to Michelle’s mother, who eventually passed it on to Michelle herself. This is, without a doubt, a true testament to the durability and sentimental value of the American pattern. 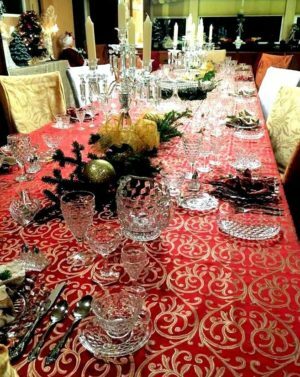 Here is a picture of Michelle’s place setting – which is quite proper, indeed. 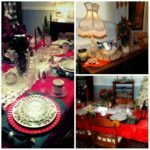 Her home was recently featured in their community holiday walk tour, in which she proudly displayed her American dinnerware on a festively adorned table. Did you notice how everything is meticulously placed? 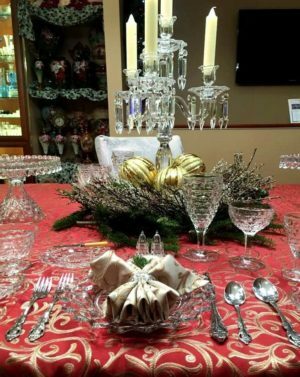 This is also a wonderful example of how to use, and where to place, the Individual Shakers (located above the Dinner Plate). Michelle does a lot of unique things with her beloved American collection; however, one thing I really like is how she serves her butter during the holidays. 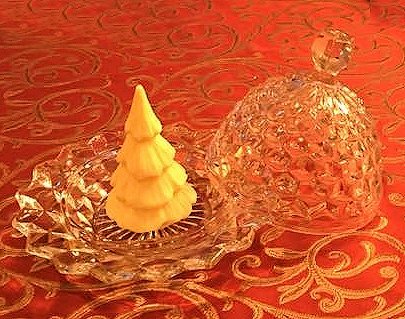 She buys butter that is shaped like little Christmas trees, and then places them in her Round Butter & Cover dishes. 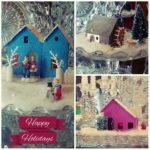 Keller’s Creamery Butter Sculptures is one place that makes them (there might be others), and then they distribute the product to certain stores during the month of December. If you can find a local store that sells them, you can achieve the same wonderful results! Doesn’t this look like the most perfect Sweet Shoppe for Santa and all of his little Elves? Different pieces of FA are being used for purposes other than what they were originally intended for. 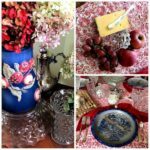 This is one trait of the American pattern that I am especially fond of – its versatility! 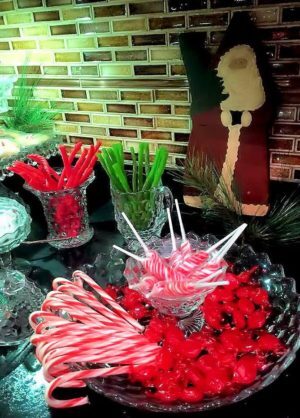 Michelle’s choice of candy colors and flavors are perfect, yet what impresses me the most is the innovative way she uses the Shrimp and Dip, the Flared Vase and the Pitcher. The Elves are going to be very happy with this menu! 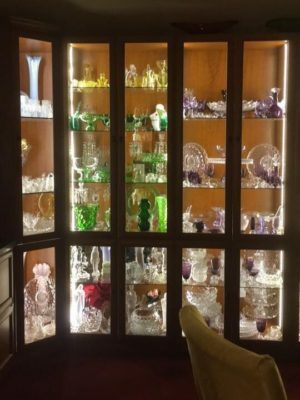 As you can easily see here, Michelle knows how to showcase her Fostoria collection in grand style. Her display presentation is simply stunning. 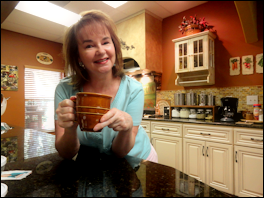 Michelle remembers that when they did the addition to their home … “My local cabinet maker decided that in order to get the best lighting for all areas of the cabinet, that we would need to run vertical LED lighting throughout. This helps show all shelves in the cabinets.” I must say, it appears that they accomplished their goal in spectacular fashion. Thank you for reading this special holiday story. A very special “Thank You” goes out to Michelle Sugg of Michigan. If you like what you have read, please be sure to let us know your comments on Facebook. Thank you, and Happy Holidays!